Somewhere in the past I've seen pictures that were taken of mile markers along the main Whitney trail. I don't believe every mile is marked along the way, but the past two years while doing this hike I haven't been able to find ANY of them. Just got a one day permit for this coming Thursday and will be searching for them along the way...... appreciate some assistance here. The easiest one to see for me is on the descent. It's about halfway between Trail Crest and the cables and it says "8.0 miles." It's painted in white on a rock. There are no signs, just a couple of painted rocks. Also, I've read many times the mileage on the rocks is not exactly accurate. The 3 mile marker is on the switchbacks on the left hand side as you climb up out of Lone Pine Lake. The 4 mile marker is on the left, right as your get to Mirror Lake. The 5 mile marker is on the right, at the end of Trailside Meadow. I've seen number 6 once, but have never been able to find it again. But I remember it was before the solar toilets at Trail Camp. Number 7 is on the left, about 3 switchbacks before the cables. Number 8 is on the left, 3rd switchback from the the top, before Trail Crest. I've never seen number 9. Number 10 is on the right hand side, after Keeler Needle, and before where you frequently run into the snow field. There is a funny looking small rock that sticks straight up on the west side of the trail. I look for that. The 10 mile marker is just south of it. I'm one of those people who count the switchbacks. I helps get me to the top. And looking for the mile markers does the same thing! Betsy, I usually bypass the Lone Pine Lake section of the trail, but you got my curiosity up. So I went the long way around and found #3. Next time I go to the summit I will try to find the others. It would nice to have a complete photographic collection of them all. I wish the the Forest Service would refurbish these little relics from deep in the last century. Could be justified on the basis of archaeological restoration. Archaeological or not, having something to gauge one's progress would be appreciated by most hikers, I would think. Thanks Bob for the pictures. So are the markers based on the length of the old trail? I went up the old trail a month ago and it certainly was shorter than the main trail up to North Fork. Is that where the extra quarter mile that I see in some reference mileages comes from? them. Wish we could come back up to the Portals on the 20th when you will be there, however, reality and jobs will have well and truly set back in by then. We usually do a Fall trip, and we met you the first time on one of those trips. So maybe we will see you in the Fall. Fred: Yep. According to Hellweg & McDonald's "Mount Whitney Guide"--a really nice book that doesn't get near the attention it should--the mileage markers are consistently short by 1/3 mile. They used a surveying wheel to determine precise values. By the way, the trail switch occurred in 1977. Originally, there was the hikers' trail and the packers' trail. The idea was to keep four-footed and two-footed animals apart until all were well on their way. The two trails joined where the Wilderness Area sign is now. But then the use of pack animals was disallowed and there was no need to maintain two trails. So one was abandoned, and it was the old hikers' trail. The reason? The hikers' trail had many switchbacks, hence many opportunities for people to cut them--and so maintenance was much higher. 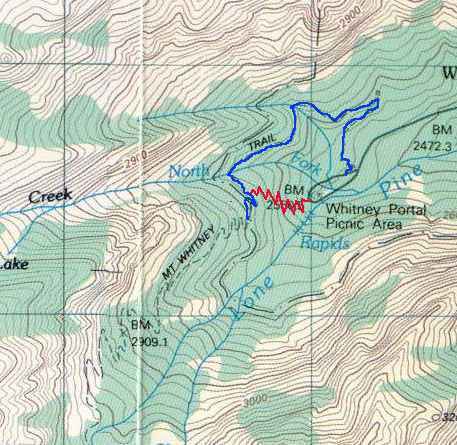 The pack animal trail had only one switchback, and it became the main trail we know today. Back then I noticed that the old hikers' trail soon fell into disrepair because of neglect. But too many people remembered it, and kept going there because it was much shorter. Eventually the folks in the USFS decided to keep this abandoned trail in decent condition, even though it is not official anymore. Still, they'd prefer that everyone use the official trail, in order to avoid erosion problems. This is another example of why we should appreciate that rangers have many duties to perform, one of which is to--without fanfare and for no other reason--quietly do those things to enhance our wilderness experiences. Betsy: I think I save about 1.5 hours on the descent if I use all of them. Going up, it depends on how much energy I seem to have that day. Less now than it used to be! Sorry, I know some of the flowers, but not many. But I do appreciate looking at them, even though we are not on a first names basis. Generated in 0.052 seconds in which 0.046 seconds were spent on a total of 13 queries. Zlib compression disabled.